Green sand beach is one of the “once in a lifetime” places to visit on the Big Island. Its actual name is “Papakōlea beach” and it is one of two green sand beaches in the United States. Green sand beach is one of the top attractions in the Ka’u district, but not the only one! If you are planning to drive to this beach from Kona or Hilo make sure to take a look at our list of things to do in Ka’u to see if you can add some fun stops to your road trip. Green sand beach is officially known as Papakōlea. The beach itself is carved in a 49.000 years old cinder cone belonging to the Mauna Loa volcano that contains the green crystals (olivines) that give the beach its name. You can read more about this in the green sand trivia section further below. Green sand beach is a small and hard-to-get-to beach close to the most southern tip of the Big Island. If you are wondering about the name, you can find out why the sand of green sand beach is green here. The main attraction of this beach is, of course, the crystal green sand. Note that the green crystals that give the beach its name are mixed with black (lava) and white (coral/shells) sand, and that thus some patches of sand are more green than others. Take the time to pick up some sand to inspect it closely. It is positively breathtaking! 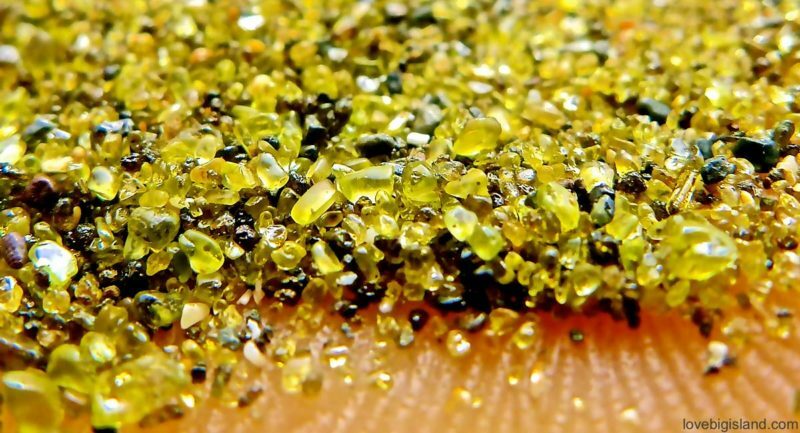 Green sand containing olivine crystals from Papakolea (green sand beach) on the Big Island. Swimming in the bay is possible although at times the surf can be rough. There are no life guard / facilities / places to buy food and/or water at the beach, so make sure to bring enough food and water along when visiting and make sure to take away all your garbage. Finally, there is no cover for the sun on the beach. If you have a sensitive skin please consider bringing a hat and/or a beach umbrella for cover. The best time to visit Papakolea beach is early (before noon) and, if you want to avoid the large crowds, on week days. Visiting early will make the hike in (and out) more pleasurable because of the cooler temperatures and staying away in the weekend will help you avoid some of the crowds. This is especially relevant because green sand beach has become more and more busy in the last years! Papakōlea beach is not easy to reach. 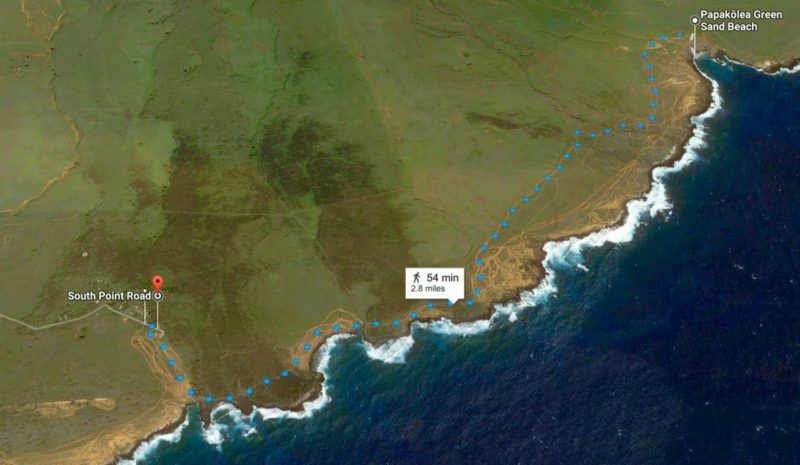 First, you have to drive to the southern most tip of the United States, then you need to hike 2.5 miles (one way) from the parking lot to the beach (see directions below). The payoff however, is significant! The remoteness of this beach makes it likely that you will have most of the beach for yourself if you arrive early, and the scenery is out of this world. Take the road to ‘South Point’ between mile markers 69 and 70 on Hwy 11 (between Kona and Volcano Village), and drive to the small harbor at the end. On the left hand side there is a parking lot where you can park your car. The hike to Papakōlea beach (Green Sand Beach) is hot but not challenging. Walk from the parking lot to the ocean and take the road to the left (facing the water, towards the east). Follow this road with the ocean on your right hand for about 2 1/2 miles and you will get to the cliffs above the Green Sand Beach. Climb down carefully along the lava cliff on the west side of the bay. The hike to green sand beach takes you over ~2.5 miles of pastureland. The hike is not difficult but because there’s no cover from the sun it can get very warm. This part of the Big Island can be very windy and hot so make sure to bring water and sunscreen. Along the way you can see plenty of interesting features such as ancient temples (Heiau). Read more about the hike itself on the great website of bigislandhikes.com. Leave no trace: We would like to stress the often used quote “Take nothing but memories, leave nothing but footprints!”. Please don’t take the green sand home as souvenir, and take an extra bag along to keep your trash. You can get an idea of the hike from the parking lot to Papakōlea beach from the 5-minute video below. Note that the 4wd rides mentioned at the 1:54 minute mark in the video are illegal (as we explain below the video). The lands between the parking lot and the beach are fragile and host many culturally significant places. Driving a car over the 4WD road to the beach damages the road and scars the landscape and the owner of the land (DHHL) does not permit (commercial) vehicular access to the beach. This means that people offering you rides from the public parking lot to Papakōlea beach are doing so illegally. All car rental companies on the Big Island prohibit you from taking your rental car on the road to green sand beach. There is plenty of interesting trivia to learn about this green sand beach. For example, did you know that there are 3(!) names that are used for this amazing beach? Green sand beach is officially known as “Papakōlea beach” (after the kōlea bird often seen behind the beach) but also as “Mahana beach” (after the cinder cone responsible for the green color of the beach). The 3rd name is also the newest nickname: “Green Sand Beach“. Do you know why the sand is green at green sand beach? Trivia for Green Sand Beach (Papakolea, Mahana beach) on the Big Island of Hawaii. Origin of the different names, history, and why is the green sand, green?. If you want to get a feel for what South Point (the starting point of your hike to green sand beach and the most southern point of the United States) and green sand beach look like, have a look at the following great time-lapse video. If you want to see Green Sand Beach directly forward the video to the 3 minutes mark.